Don’t second-guess yourself. After all your hard work this year, you and your family deserve a getaway. 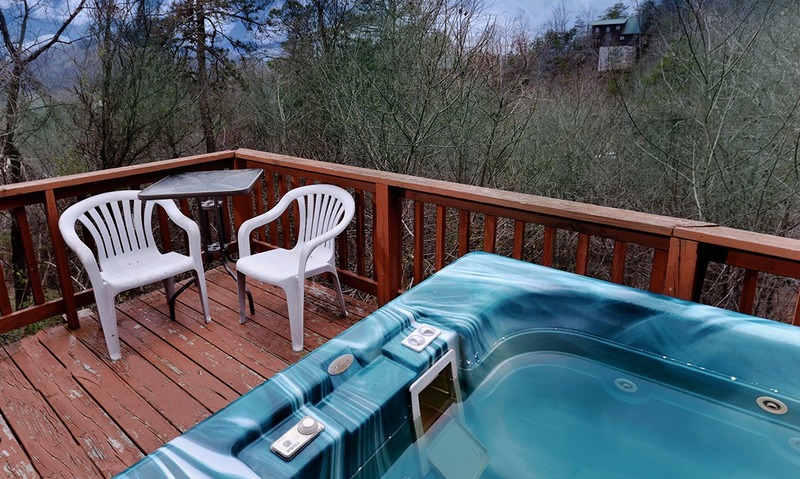 So why not book your stay at Mountain Getaway in Pigeon Forge? 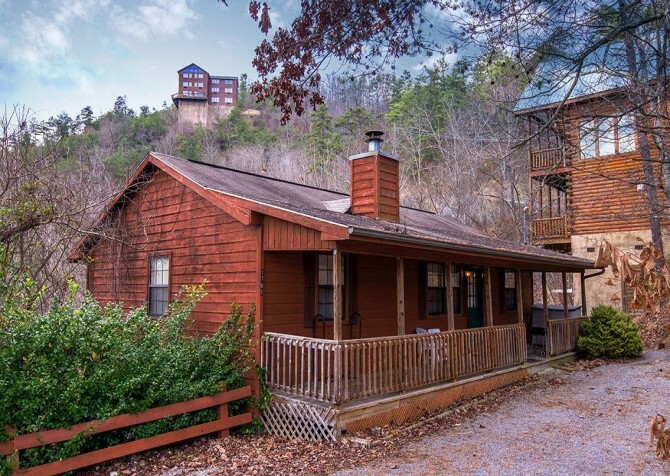 This 2-bedroom cabin, located only about 5 miles from downtown Pigeon Forge, provides you with all the comforts of home plus a few special perks you’ll only find in the Smokies. These include an outdoor hot tub with peaceful mountain surroundings and a heart-shaped indoor tub where you can soak away your stress during your Pigeon Forge retreat. What else will you love about Mountain Getaway? 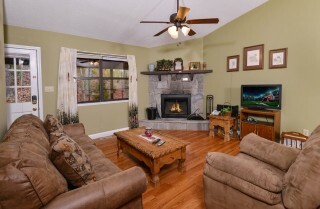 How about the stone-set wood-burning fireplace in the living room, where you can warm up when the weather turns chilly? So what are you waiting for? Bring your family or a small group of friends to Mountain Getaway today! 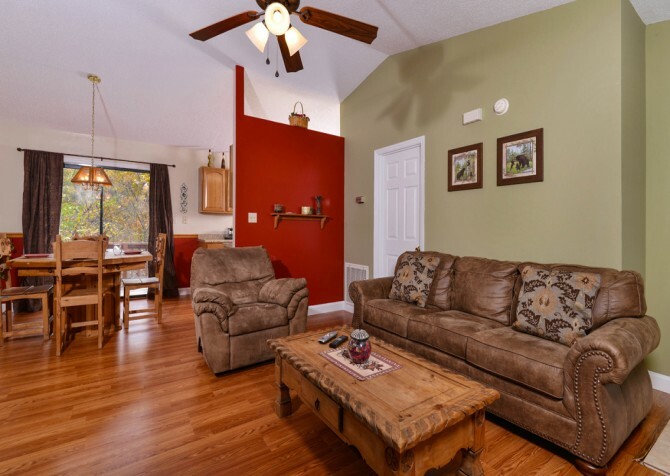 The charming front porch of Mountain Getaway leads to an equally charming living room inside this Pigeon Forge cabin. With traditional mountain décor and comfortable furnishings like a large suede couch and matching chair, the Mountain Getaway living room will be your favorite place to retreat after long days of adventuring downtown. You’ll find all your favorite accessories from home inside this space, including a ceiling fan, reading lamp, and side table for your favorite books or a glass of wine. 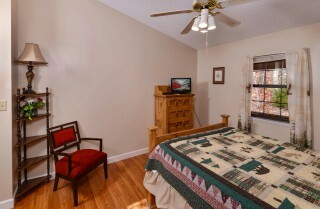 You’ll also find a second upholstered chair for extra seating during your stay. So make yourself at home at Mountain Getaway. Curl up on the couch and watch your favorite shows together on the flatscreen TV. Or bring along your favorite DVDs and plan for a family movie night in front of the wood-burning fireplace with a gray stone overlay. You can even clear off the coffee table and have a family game night with old classics like Monopoly or Scrabble or new favorites like Apples to Apples and Balderdash. 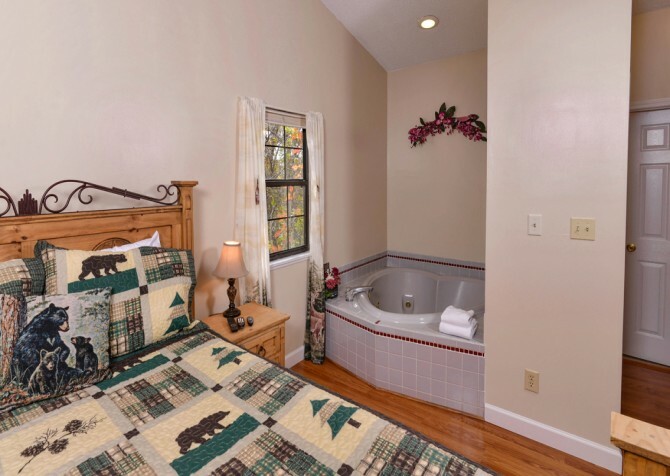 Spending time together can be cozy, relaxing, and full of fun at Mountain Getaway! 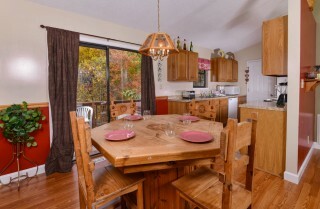 The cozy kitchen of Mountain Getaway provides everything you need for a small-group retreat to the Smokies. 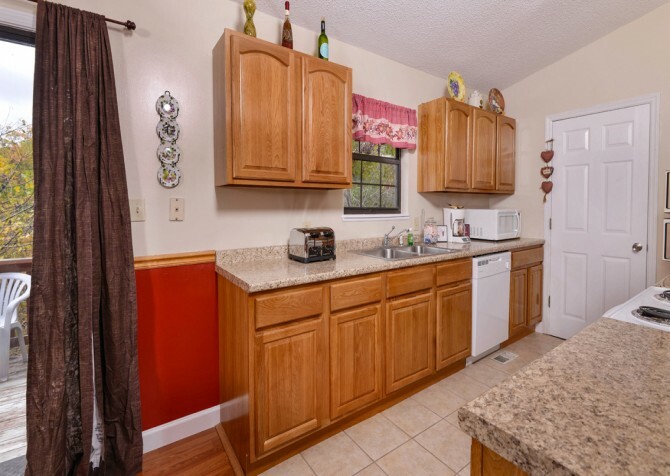 Inside the kitchen, you’ll find all your major appliances, including a full-size refrigerator, oven, electric stove, dishwasher, and microwave. Additionally, you’ll have access to a coffeemaker, knife set, toaster, and all the cookware and utensils you might need while you’re away. 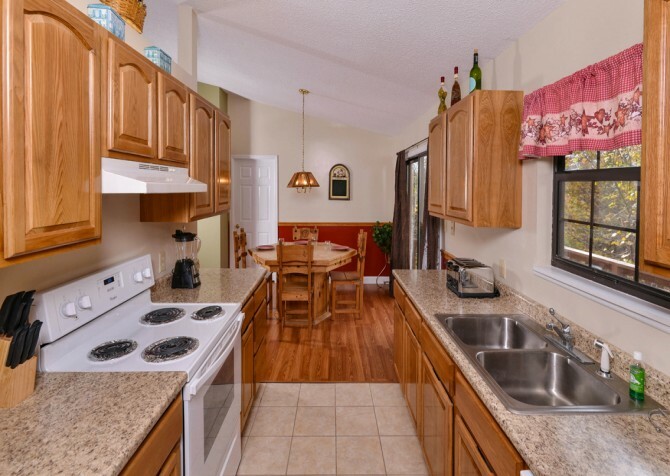 The design of the kitchen provides plenty of counter space for your small group, as well as cabinet space for storing away snacks while you’re in the mountains. Be sure to take advantage of everything the Mountain Getaway kitchen has to offer. Cooking meals in the cabin is the perfect way to stay within your budget by staying out of pricey restaurants. Instead of eating out every night, check out our Pigeon Forge restaurant directory and visit a few favorites. Then, use the extra money you save for fun adventures with the family downtown! After you’ve prepped and cooked your homemade meals in the Mountain Getaway kitchen, you’ll find the perfect space to enjoy those meals together in this cabin’s dining room. The dining area comes with a unique wooden table with angled sides and 4 matching chairs. 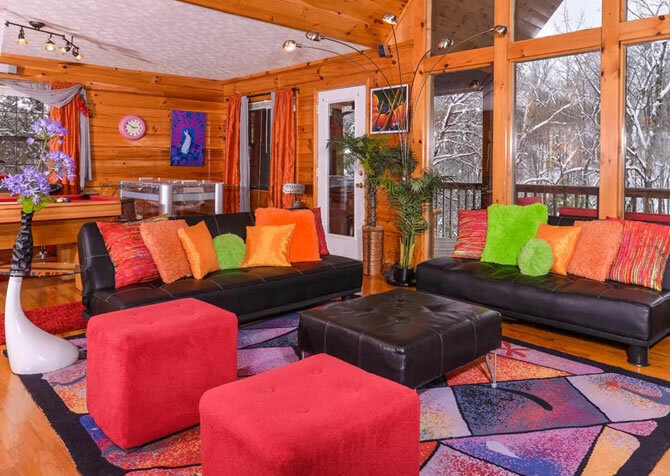 Because this cabin can sleep an additional 2 guests, you’ll be happy to know that the dining room is open to the living room, where other guests can eat without missing out on the dinnertime conversation. The dining table is positioned under a warm light fixture that provides an intimate setting for your Mountain Getaway meals, but what’s even better about this dining space are the floor-to-ceiling windows right next to the table. Enjoy natural light and tree-lined views as you eat. These are views and a private setting you can’t get in a restaurant downtown! 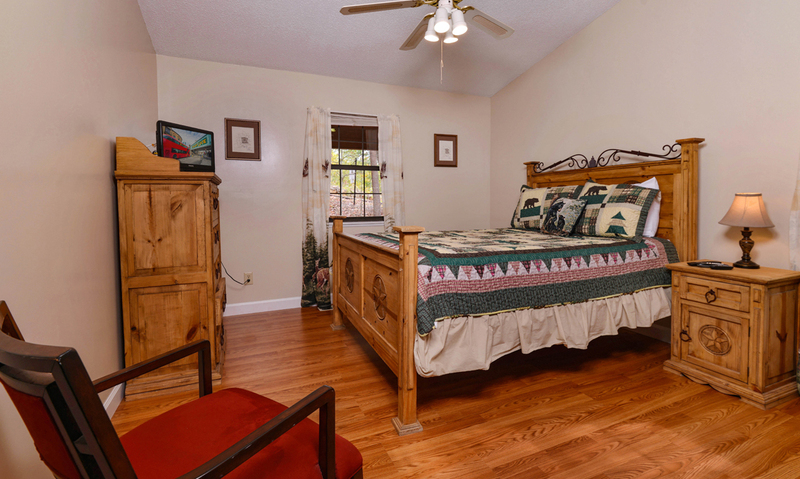 Mountain Getaway features 2 bedrooms, both of which feature queen-size beds and robust wood furniture with a beautiful stain and intricate design. The bedrooms also come with their own flatscreen TVs, ceiling fans, nightstands, reading lamps, windows to let in the colors of the Smoky Mountain sunrise, and storage space. 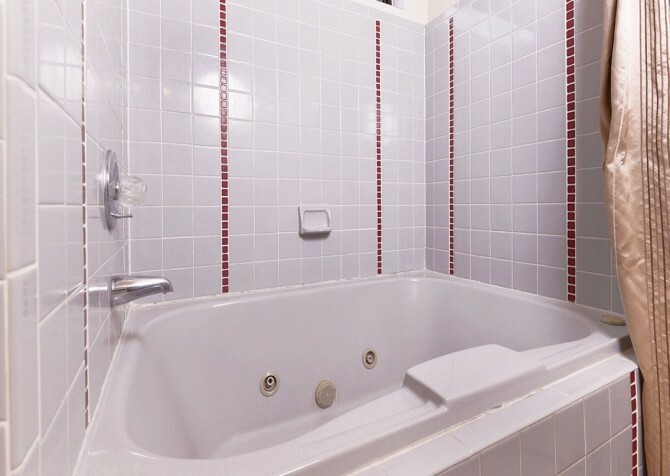 The second bedroom comes with a couple of additional features, including an extra window and a heart-shaped, indoor jetted tub for the ultimate relaxation experience while you’re away. 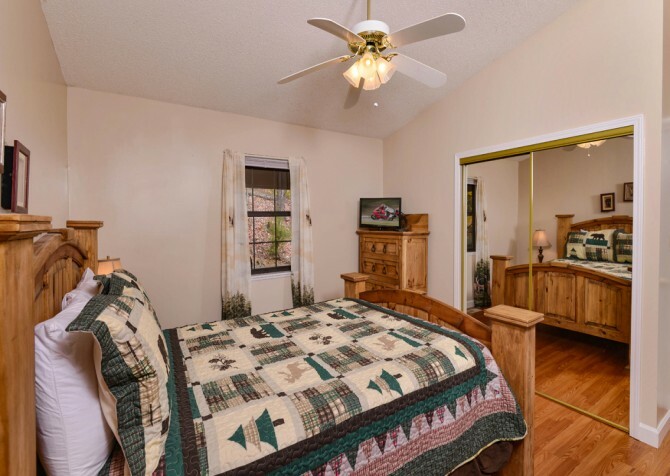 To accompany these bedrooms, Mountain Getaway comes with 2 full-size bathrooms, which should provide plenty of space for everyone to get ready in the mornings—including any extra guests that might be tagging along. Mountain Getaway can comfortably accommodate up to 6 guests total between its 2 bedrooms and additional sleeper. So bring the kids or bring a couple of friends and enjoy your time together in the Smoky Mountains! When you come to the Smoky Mountains, one of the best reasons to stay in a Cabins for YOU cabin is the peaceful mountain setting they offer. Many of our cabins are nestled right in the middle of the Smokies, giving you private views of the mountains and trees. 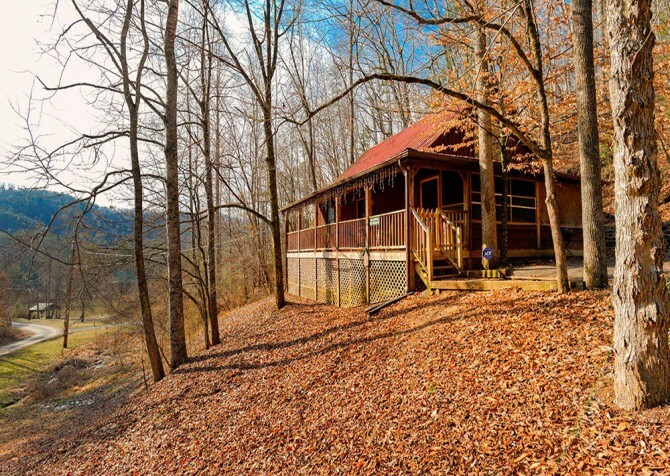 This charming cabin provides lovely tree-lined views right from the comfort of your back deck, along with mountains in the distance. 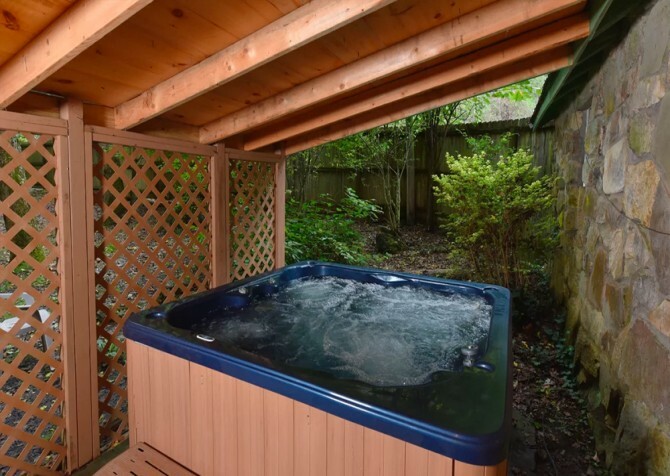 No matter what season of the year you decide to visit, you can enjoy these views while taking a relaxing soak in your outdoor hot tub. Or you can sit in one of the provided deck chairs with a warm cup of fresh-brewed coffee in your hands. 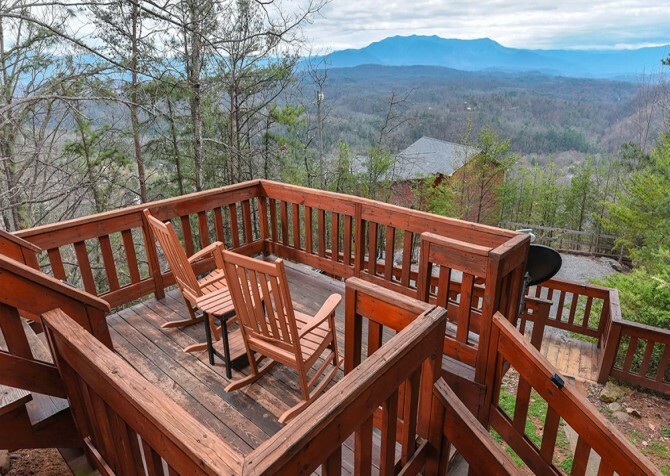 You can also take advantage of the outdoor side table and play a game of cards while soaking in the sights and sounds of the Smokies on those long summer evenings. Or you can make a visit to a local winery during your Pigeon Forge getaway so you don’t have to let these evenings pass without a glass of something refreshing in your hand. Mountain Getaway is a cozy 2-bedroom cabin with all the homey amenities you would expect to find in your Pigeon Forge getaway. 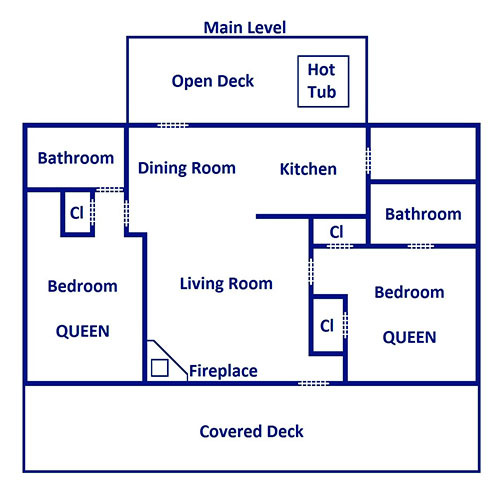 These include little things like a DVD player, CD player, ironing board, and free Wi-Fi. You won’t be missing out when you stay at Mountain Getaway. 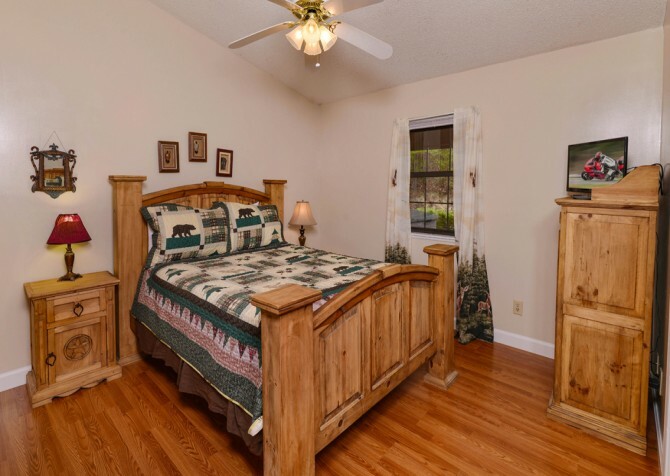 Mountain Getaway is close to downtown Pigeon Forge (only about 5 miles away) and close to downtown Gatlinburg as well (about 9 miles away). There are dozens of family-friendly attractions in either city. 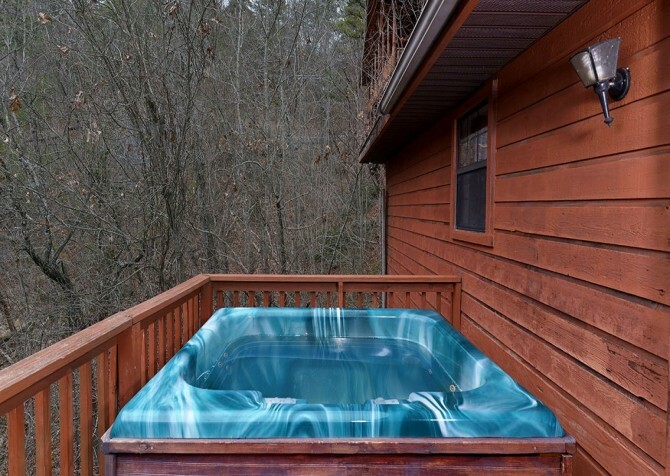 Here are some ideas to get you started on your Mountain Getaway. This family-friendly amusement park has been entertaining Pigeon Forge guests for decades. Enjoy world-class entertainment and high-octane rides at Dollywood. Dinner downtown doesn’t have to be same-old, same-old. Enjoy a classic Southern menu and a rodeo-style show with the whole family at Dolly Parton's Stampede. Unique shops, carnival rides, and delicious restaurants are just some of the reasons to spend the day at The Island. Try a turn on the 200-foot Great Smoky Mountain Wheel, too! "Cabins for You has always been a great company to go through, to book you cabins. As we always have great experience with them. You can't go wrong with Cabins for You." "We stayed at one of your beautiful cabins for 4 nights last week. Everyone had a terrific time. The cabin was so nice. Some of our family had never stayed in a cabin before! It was so quiet until morning when someone's rooster woke up but that was ok it adds more wonderful memories. We definitely want to stay with you again."